A detailed, intricate new environment that can't quite top Sapienza. What is it? If you don't know, you should go here. Each new Hitman level brings with it not just a new location, but also a change in tone. Paris was a soiree of elites—both the fashionistas below and the information brokers that secretly fraternised above them. Sapienza was light and airy—the sort of place that could accommodate an exploding golf ball. This third level, set in Marrakesh, is something else entirely. It's the setting for a political conspiracy, based around an army general's attempt to orchestrate the populace into providing the justification for a military coup. Hitman's story is starting to shape. It's clear that, as in previous games, 47's hits are connected. There's a plan, and we're slowly working towards its unveiling. So far, this overarching plot is told almost entirely through the short cutscenes that play after each mission's completion. As such, each mission is its own standalone tale. 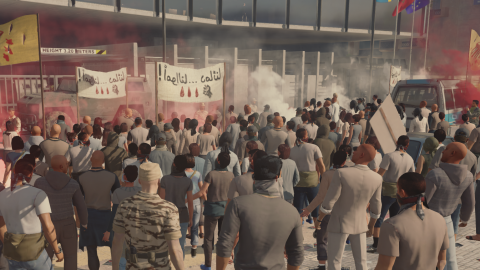 Marrakesh features what is, to my mind, the best environmental story this Hitman has yet told. There's a sense of intrigue and purpose to events. You start in a small restaurant, outside which a crowd has gathered to watch news reports of the protests a few blocks away. Down a side-street, through a gorgeous souk filled with ornate lamps and carpets, concerned NPCs discuss local politics across from a stream of oblivious shoppers. At the other side of the map, you'll find the protests themselves. Throughout, you'll hear snippets of conversation that broaden your understanding of the situation, and the intrigue and manipulation involved. It's not that the story is particularly surprising or eventful, but it deftly sets the tone by fleshing out the source of tension in the area. That's all I really need from a Hitman setting. In terms of area, Marrakesh feels smaller than Sapienza. But where that was a sparse, sleepy town, here 47 must move through bustling streets packed with people. An interesting consequence of the crowds is that it feels like you're always being watched. In the city proper, it can be difficult to pick locks or sabotage equipment. Tempting costumes can be found throughout, but choking out their owner is almost always a risk. In the city proper, it can be difficult to pick locks or sabotage equipment. Away from the main square, the mission's two targets each occupy their own restricted building. The first, General Reza Zaydan, occupies a nearby school that the military have taken as an HQ. It's a heavily patrolled space, and many of its soldiers will see through a military disguise. This is the first target in the new Hitman—save perhaps for any contracts that take you up into Paris's attic—to encourage a more traditional stealth approach. The second target, Claus Hugo Strandberg, is a former CEO hiding out in the Swedish consulate. It's a minimalist office space, and favours the more familiar disguise based approach. Beyond that, there's plenty to be discovered on rooftops, down alleyways and in the member's only shisha bar. As in previous episodes, a handful of opportunities send you on a collision course with the targets. Here, though, they seem less like the focus. Maybe it was the way I played, but I felt as if the impetus was more on discovery and experimentation—pushing at the cracks of each target's security to see what I could break through. Marrakesh is a good level, and evocative, but doesn't quite match Sapienza. It's more serious, for one thing. Nothing has the same playful dark as Caruso's relationship with his mother. And despite the quality setup, the world feels static. Any tension created by the presence of protesters is squandered by their inaction. Worse still, the AI seems unable to realistically respond to the situation. If military personnel are targetting 47, they'll happily shoot through the crowd. In response, protesters simply cower a bit. The reuse of voice actors is becoming more noticeable, too. I swear the woman trying to sell me carpets was in Italy last month, berating her lazy brother. Overall, Marrakesh is another success, and another great space waiting to be filled with contracts, escalations and elusive targets. Three episodes in, I'm now confident that Himan is the Blood Money successor I wanted. Hopefully, having already made such a strong statement of intent, future episodes will progress things further still.